The next time you are thirsty and grab a plastic bottle of water from the nearest supermarket shelf, you might want to think about what you are doing to the environment. These plastic bottles, which we apparently discard without a care, find their way to a landfill where they remain as trash, taking years to disintegrate. And that is exactly what is worrying eco-campaigners. The stats are alarming: According to a report by the World Wide Fund for Nature (WWF) around 1.5 million tons of plastic is used by the bottled water industry each year. That's a lot of bottles, a lot of landfill and a lot of plastic. A Gulf News report in January pointed out that each person in the UAE consumes up to 450 bottles of water every year - the highest per capita consumption in the world. An estimated 275 litres of water - or 350 to 450 bottles - are consumed per capita every year, according to a study that was initially carried out by the Worldwatch Institute. Keen to do something about the mounting pile of plastic rubbish, Dgrade Clothing, a UK-based garment manufacturer that has set up a branch in Dubai, hit upon a novel idea - to create clothes from plastic. "Dgrade works with recycled materials to make great clothes literally from rubbish, a process that has been recently pioneered by knitting fabric with thread extruded from recycled plastic water bottles," says Kris Barber, the company's managing director, who had more than 20 years experience in the clothing business before he first came across plastic yarn. The resulting fibre rivals cotton in texture and feel. It also has a lot more benefits than cotton - it's more durable, tougher and is less prone to shrinkage - ideal for creating adventure, leisure and casual clothing. Dgrade designs, produces and develops a range of clothes made of jersey, fleece, twill, and denims, using post-consumer plastic bottles. "A 50 per cent cotton, 50 per cent polyester T-shirt can be made from three 500ml water bottles and cotton yarn," says Kris, proud his company is doing its bit for the environment. "Thirty such bottles go into the making of a pair of brushed twill park shorts, while a jacket would take between 40 and 60 bottles. "Our factories buy post-consumer plastic bottles recovered by recycling companies," Kris adds. "These are then shredded into flakes and heated and extruded through a spinarrette (something like a showerhead). When cooled the strands of plastic (polyester) are then crimped and re-shredded into fibre. In some cases this fibre is then blended with cotton and spun into yarn, then knitted and dyed to produce blended polyester/cotton or 100 per cent recycled polyester." Until recently such eco-friendly fabrics were hugely expensive. "However, with the price of cotton almost doubling in the recent past, our products have become more competitive and we now offer a real alternative to harvested cotton, without the environmental impact that cotton growing causes," Kris says. Cotton uses huge amounts of water and pesticides to produce, whereas the process Dgrade uses to convert plastic bottles to yarn and fabric uses 20 per cent less water, 50 per cent less energy and has 55 per cent less carbon emissions than producing conventional polyester. The yarn, made for the UK company Greenspun in China, is a viable and positive alternative to polyester, Kris adds. Dgrade today has an entire supply chain and produces clothing under the brand Dirtball and under licence for Spiked. "We also use Greenspun yarns to make clothing and accessories for some of the largest retailers and brands in the world including Tesco and Marks & Spencer," Kris says. "It's now possible to make pretty much any polyester-blended fabric using recycled plastic bottles and that means you can make everything - from T shirts to waterproof/ breathable jackets, shorts and even jeans." Dgrade's Dirtball brand is targeted at young sports enthusiasts. "We make clothes to order for all our commercial customers. Our clothes are worn by some of the best extreme sports athletes," Kris says. "We have recently had fashion shoots done in alpha. magazine and expect to be seen on catwalks in the country this summer." Kris hopes fashion houses in the region will also jump onto the environmental bandwagon soon, to further the cause of awareness here. Pointing out that the lifespan of recycled fabrics far exceeds that of conventional fabrics, he notes that the material does not go out of shape, is more durable than conventional fabrics, and is priced a mere 20 per cent above what you would pay for regular cotton fabric. 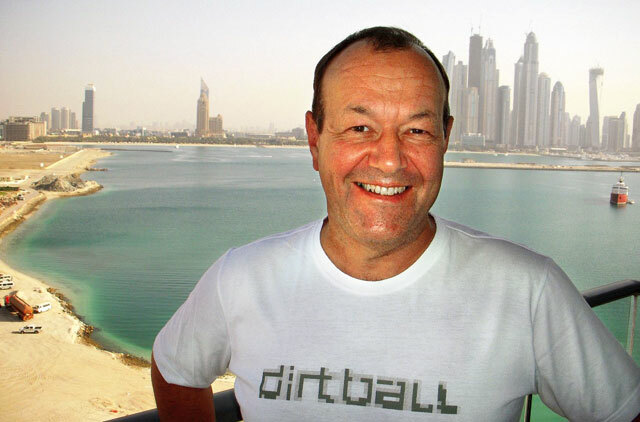 A Dgrade T-shirt costs around Dh150, and shoppers can buy the Dirtball brand in the UAE through the company's website, or from the Aquarium shop at The Dubai Mall. Plans are afoot to expand the company's regional operations. 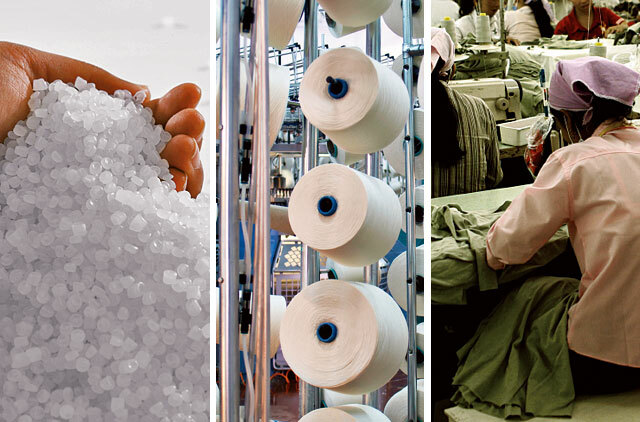 Dgrade Clothing and its supply of plastic bottled waste is audited strictly by SEDEX, which is a UK-based not-for-profit organisation dedicated to driving improvements in responsible and ethical business practices in global supply chains. Kris says that although more people are now aware of environmental concerns, and make concerted efforts to separate waste so that it can be collected and recycled effectively, the problem still persists. "Do you know that 95 per cent of all plastic ever made is still on the planet today?'' he asks. Some kinds of plastic can take hundreds of years to biodegrade in a landfill. More than 45,000 tons of plastic finds its way into the ocean and is responsible for the deaths of millions of marine creatures including turtles and dugongs every year, because they inadvertently ingest it as they graze and forage for food. Nearly one in two camels dies from ingesting plastic, usually in the form of plastic bags, which find their way into the deserts from picnic bags and mounting piles of rubbish left by travellers. Eventually, they get calcified inside the camel's stomach, blocking the intestines, and causing the animal to suffer a painful death from starvation. As much as 60kg of calcified plastic has often been found inside a camel's carcass, showing how serious the problem is. 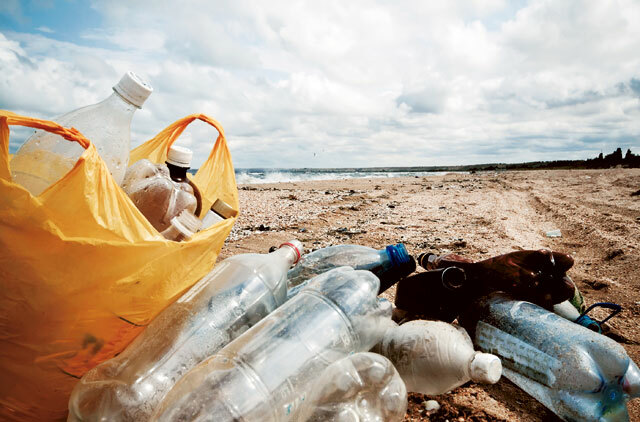 The problem of plastic waste, particularly that generated from drinking water bottles, has increased over the years, with the UAE today counted among the highest consumers in the world, after the USA, Mexico and Italy. Producing the fabric requires between 60 to 90 days, which includes the time taken to ship the consignment of plastic waste to China where it is converted into yarn, woven into fabric and fashioned into clothes by the manufacturing unit in China, before they are shipped back to the UAE. "The quantity of plastic produced in the UAE is the same as in the UK, however the population here is only 10 per cent of that in the UK," Kris points out, highlighting the need to reduce the country's carbon footprint. He urges that we all follow reduce, reuse and recycle techniques that can go a great way in helping to make our planet green. To escalate its awareness programmes especially among Generation Next, which Kris believes has a greater stake in the greening of the planet as they are its natural inheritors, his company has planned the Dgrade Plastic Challenge and an Inter school T-shirt Competition due to run from April 1 to 22 in 20 GEMS Schools in the country. The schools that collect the most number of plastic bottles in four weeks will win a prize. "Eco activists David and Theresa Wernery from Plastic Not So Fantastic (PNSF), will also be on hand to talk about the effects of plastic pollution and their Round the World Expedition which starts in May, of which we are one of the proud sponsors," says Kris. A T-shirt competition will also be launched alongside the Dgrade Plastic Challenge on Earth Day, April 22, with participating students designing a T-shirt with a slogan, where the winner will get his or her T-shirt manufactured using plastic, among other prizes. Customers who want to recycle an item of Dgrade clothing can take it back to the company, which will give them a 20 per cent reduction on their next purchase.